Henry Louis Gehrig (born Ludwig Heinrich Gehrig; June 19, 1903 — June 2, 1941) was an American baseball player. Due to his reliability and stamina, he was nicknamed the Iron Horse. He played with Babe Ruth and the New York Yankees who were thought the best team of that time. He played with the Yankees for most of his playing time which started in 1923 and ended in 1939. He played in 2,130 games without a rest, which was the most of any player until Cal Ripken, Jr. in 1995. When he stopped playing as well, he went to a doctor who found out Gehrig had amyotrophic lateral sclerosis (ALS – which is now sometimes called Lou Gehrig's disease). The doctor told Gehrig he had only a short time to live. On July 4, 1939, there was a celebration of Gehrig by the other Yankees, and Gehrig gave a speech that became well-known. When he spoke that day he said he was "the luckiest man on the face of the earth". The mayor of New York City congratulated him for his teamwork. He died less than two years later in New York City. 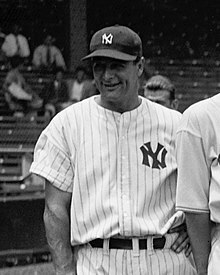 Wikimedia Commons has media related to Lou Gehrig. This page was last changed on 25 September 2018, at 00:04.